Gone are the days when being stuck in a hotel room across the other side of the world meant churning through hundreds of channels that lack those all important English subtitles. 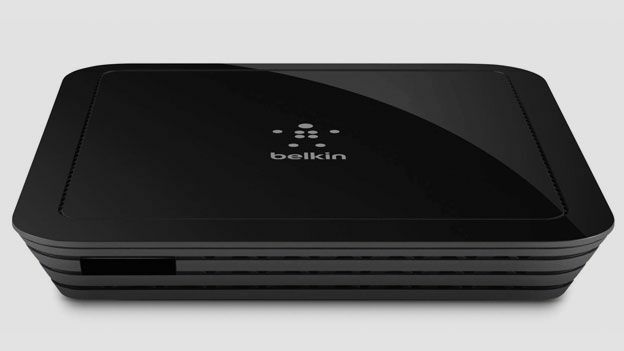 The Slingbox has ruled the roost for media streaming TV straight from your living room and to your laptop or phone but now the Belkin @TV Plus brings some healthy competition performing much the same way but also adds the ability to record live TV and stream over 3G. It should perhaps come as no surprise that there is something distinctly router-esque about the @TV Plus in the looks department with its light, boxed design and ports located at the back of the device, however the glossy back look at least gives it more sleeker feel than the your average broadband box. As mentioned, there's nothing much going on the front or side of the devices. Everything you need to hook up to a set-top box, DVD or Blu-ray player is at the back, including an Ethernet port as well as connections for the component and composite cable (both in and out), power adaptor and the IR blaster which has to be fed underneath the box and placed in close proximity to the IR sensor on your set top box. The good news is that the @TV Plus has its own built in Wi-Fi which is ideal for connecting to and setting up if your computer and TV are miles away from each other. We were fortunate to get our hands on an early sample so had to install firmware updates before beginning the relatively straightforward process of hooking up the supplied cables for the @TV Plus to our set-top box and positioning the IR blaster. Once that's all taken care of, there's a series of setup screens to negotiate your way through on a PC or Mac to select settings such as the type of set top box and remote you use to accurately mirror the functionality on a computer or mobile device. You can also set up the TV guide, but there was no support for UK guides so that was left blank in the interface. To go mobile you of course need the app. For smartphones you need to pay a one off fee of £12.99 but for tablets it is free. Once downloaded you can sign in with your @TV Plus sign in to begin watching and recording exactly what's on the box. Thankfully the app has a unified interface across iOS and Android while the desktop version is simply laid out and easy to get around. It's also nice to see that there's support reaching as far back as the iPhone 3G. Once the app is installed you'll have the option to stream from @TV, view the TV guide, playlist and settings where you can choose streaming quality from normal, medium and high. Unlike the Slingbox, you can do this over Wi-Fi and a 3G connection, however the latter was a little trickier to set up because it required fiddling with manual router settings which does take you down a confusing path. One of the other advantages of the @TV Plus over the Slingbox is the possibility to record live TV which, depending on the storage on your device, can be stored to watch when offline. Whether using the desktop player or the app simply bringing up the remote control and hitting the record button begins the process but you will be notified about your memory if you're running out of space. In terms of image quality, the maximum video output is 1080i, so don't expect crisp high definition telly but on both the desktop and mobile player images were generally decent and improves depending on the strength of the connection but did noticeably lacked real vibrancy. The remote control suffered from some minor lag issues when changing channels or trying to access menu options on the Sky set top box but is merely seconds and when you are away in another country this is unlikely to be a cause for frustration. While the desktop version uses a virtual copy of your actual Sky remote, the app offers a transparent control panel that is overlaid on the screen and offers digit based controls with a handy indication of the bitrate streaming quality. It's certainly refreshing to see someone try to offer an alternative if not a better option to the Slingbox and while the @TV Plus is not perfect it certainly performs well in the key areas of streaming and offering an intuitive interface. We loved the simplicity of the apps on both mobile and desktop particularly the added touch of replicating remote control features. The ability to record live TV so effortlessly is a massive advantage over the Slingbox and the fact that there is support for up to eight devices impressed as well. In the next iteration of the device we'd like to see the addition of HD streaming and perhaps make the 3G streaming setup a little easier to configure for someone who doesn't want to start playing around with router settings, while it seems odd to make the smartphone app paid and not the tablet version.